The Silent Auction Template available to you for download on this page should make the process of making an advertisement for your event simple and quick. Below is a little explanation of how to use this template and some tips to make it go further. After you have downloaded the file to your computer, open it. Software compatible with Publisher 2003 will open up the document and show you what the basic advertisement looks like. You can start customizing the template by changing Name of School at the top to the name of the school or business that will be holding the auction. The next bit of information to enter would be the date of the event where the document has Saturday, May 6th. Finally, you can add contact information about getting tickets for your event at the bottom right where the phone number 708.555.0155 is. After you have finished editing that information, you are ready to print unless you want to further customize this document. If you want to do more with this flier then make sure to read the following tips. Even though it is a Silent Auction Template, you can change the type to suit anything that you have planned. By changing Silent Auction to something that better suits your activity the template can be used for more than just silent auctions. You can easily change the pictures in the middle and the border around the outside to other colors or other pictures to match your school or business. You can also add text that states,“Bring this flyer for a dollar off!” at the bottom to give added incentive for the recipient to attend. Make sure that the flyer has information on where, when, and how so that the people that receive this know all the information that they need to know. If you need more room to put all of the information, try shrinking the text on the bottom half of the document to give you more space for important details. 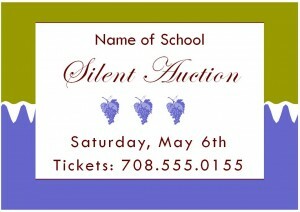 The Silent Auction Template that you can download for free below is very quick and easy to use. You can customize any way you want to work for a variety of activities and get-togethers.